Diaphragm pressure vessel: 8 l/PN16 to be arranged on the discharge side. With a diaphragm made of butyl rubber, with DVGW/KTW approval, completely safe in accordance with food safety laws for testing and inspection purposes, with drain and throughflow valve with DVGW/KTW approval in accordance with DIN 4807. Fluctuating inlet pressure is compensated by the speed control integrated into each single pump as long as the pressure fluctuation is not greater than the difference between the setpoint pressure value and the zero-delivery head of the single pump at minimum speed. If the pressure fluctuation is greater, a pressure reducing valve must be installed upstream of the system. When installing residual-current-operated protection switches in conjunction with frequency converters, bear in mind that only universal-current-sensitive residual-current-operated protection switches in accordance with DIN/VDE 0664 are to be fitted. The series Helix VE pump being used is already equipped with an integrated dry-running detection as safety equipment for the pump. Nevertheless, the installation of a low-water cut-out switchgear is required in cases where the pressure boosting systems are connected directly to a public mains power supply; that prevents the inlet pressure in the mains supply line from falling below 1.0 bar. Please order directly when ordering the pressure boosting system. The WMS will then be installed in the pressure boosting system, electrically wired and fully tested by Wilo during the final functional test. Always observe the specifications in DIN 1988 (EN 806) when using and operating the pressure boosting system. (**) That does not apply to fire extinguishing systems in accordance with DIN 14462. Please request these separately. Single-stage low-pressure centrifugal Wilo Pumps with axial suction point, according to EN 733 and ISO 5199, mounted on a baseplate. Wilo Pumps Single-stage low-pressure centrifugal pump as baseplate pump with axial suction piece with flanged bearing bracket and axis mounting for flexibly coupled drives. If pumps with 2900 rpm are installed inside residential buildings, then corresponding noise reducing measures are to be implemented. Pump curves and specific motor powers depend on the respective fluid being pumped. Pump curves and power vary considerably when fluids are conveyed that differ from water in thickness and/or viscosity. For this, please observe the table “Recommended limit values for dimensioning”. All Wilo standard pumps are equipped with IEC standard motors. The Wilo control devices are suitable for automatic load-sensitive speed control of pumps that are driven by any standard motors of conventional manufacture. for automatic, infinitely variable pump power control. for additional information, see “Switchgears and control devices” section. The Ebara – Submersible cast iron grinder pump model DGUII, DGFU cast iron submersible grinder pumps are ideal for use in small-scale pressurized commercial or residential sewage transfer systems requiring low flow and high pressure rates. The heavy-duty high chrome iron grinder system has powerful blades that reduce solid sizes for smooth, non-clogging flow. A reversible grinder ring provides longer service life and less maintenance. 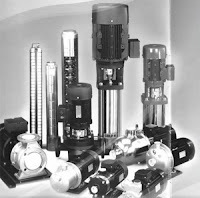 The pump is small and light weight affording ease in transport and use in temporary installations. FM explosion proof motors are available. banyak macam-macam produk pompa yang kami jual, dengan kualitas dan penggunaan bahan-bahan yang aman, menjadikan pompa yang kami jual sangatlah handal dan memiliki daya tahan kual, kami mangajak setiap konsumen untuk menghemat penggunaan air bersih dengan memakai air bersih sesuai kebutuhan saja. With initial hydraulic coverage to 100 GPM and 800 feet TDH, the EBARA Pumps model EVMU is designed for booster, water purification, and hot water applications pumps. State-of-the-art formed stainless steel and several proprietary internal components make the EBARA pumps model EVMU superior to existing designs. The EVMU material is between 50 to 100% thicker than all current similar product offerings, for a true industrial design with cast stainless steel pumps flanges for maximum installation support. EVMU 32, 45 and 64 models consist of cast iron or 304SS hydraulic assemblies. Different mechanical seal face options are available for the three models and incorporate a separate thrust bearing in lieu of motor bearings, a popular design feature. Head Pumps: 27 to 930 Ft.